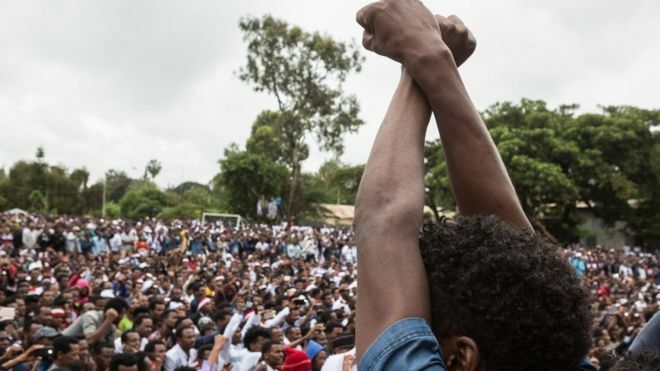 A court in Ethiopia has sentenced more than 30 people to long prison terms for belonging to an outlawed group. All the accused belong to Ginbot 7, a group committed to overthrowing the government. The Ethiopian government designated it a terrorist group in 2011. The move comes just two weeks after the government announced it would free some politicians who have been convicted or who are facing various charges in court. Members of the Ginbot 7 group, founded by an Ethiopian-born British citizen, Andargachew Tsege, will now serve sentences of between 15 and 18 years. Dozens more have been jailed by the courts over the past weeks due to their association with the group. Meanwhile, a leading opposition figure and his co-accused have been sentenced to six months in prison for contempt of court. Bekele Gerba, an official of the Oromo Federalist Congress, was jailed after he protested against the non-appearance of defence witnesses in the court trying his case. The judge was angered after he reportedly sang a protest song in court. He is among politicians who would have charges against him dropped following the announcement by Prime Minister Hailemariam Desalegn, many Ethiopians believe. The government would say there is no contradiction between its recent statement on freeing prisoners and these sentences. Although their supporters are hoping they will be released, the authorities here see Ginbot 7 members as terrorists, not political activists. Both its current leader Berhanu Nega and its founder Andargachew Tsege have been sentenced to death in absentia by an Ethiopian court for trying to overthrow the government. They both deny the charges. Andargachew was extradited to Ethiopia in 2014 while Berhanu’s whereabouts are unknown. Berhanu, a former university professor in the US, has previously threatened to march to Addis Ababa to remove the current government from power. The government says the US-based group is sponsored by Eritrea and accuses it of trying to infiltrate the country. Most of its members live in exile but authorities says some are active – but in hiding in Ethiopia. It is highly unlikely that if any prisoners are released, Andergachew would be one of them as the government has previously taken a very strong stand against his release, despite massive pressure from the UK and human rights groups. Up until now, the government has not followed up on its promise or issued a clear timeline on when those politicians jailed would be set free, reports BBC Ethiopia correspondent Emmanuel Igunza in the capital, Addis Ababa. Ethiopia has always denied that there were any political prisoners in the country, as alleged by human rights and opposition groups. The country has been hit by a wave of political unrest in recent years. In December, social media users staged a day of action to remember those held behind bars.